Photo by Chris, mom of Precious Angel Tricia Seymour. Love. I don't know where you are, so I am going to post this a little bit early just in case you are in another time zone, because even though it's four hours until your birthday here, I would not want you to ever think I might have forgotten. So Happy Birthday, Michaela. Happy, happy birthday to you, wherever you are. Yesterday I was going through photographs of you, from when you were a tiny baby, a toddler, preschooler, up through age nine. In with the photographs were some of your drawings, your letters, books of stories. I found a lot of photographs I want to scan and post on this blog for you, once I get the scanner up and working again. I want to share with the world how adorable you were when you were little. I want to remind you of who you are. Looking through these photographs and your drawings and writings, took me right back to the times and places where the photos were taken. But I want you to know that this was not an exercise in sadness for me. It was pure sweetness. Looking at your little face didn't make me cry. It made me smile. This is important, Michaela, because it is a confirmation of the fact that the beauty and joy you brought to my life cannot be diminished by what came after. The grief and sorrow and loss, they are their own thing. They are very real. But you ... your goodness, your light, your love, and my happiness in holding you, in watching you grow, in looking into the oceans of blue in your eyes, in seeing your sweet smile, the golden sunshine in your hair. That is what you are to me. The black hole of sorrow -- that is not you. All that is, is the absence of you. And wherever you are, Michaela, you are still all those things to me. Wherever you have been, whatever you have done, whatever has been done to you -- those things matter not at all to who you are, to how much you are loved, to how much you are missed. Today, Michaela, you are the age that I was when you were taken away from me. Do you have children, I wonder? Perhaps you do. Perhaps that is what holds you back from leaving where you are and coming home. If that is so, I understand. I remember when we watched the movie "Baby Boom," you told me that when you grew up you wanted to be just like me ... meaning to be a stay-at-home mom whose kids were the most important thing in the world. It's kind of unbelievable to me how long it takes me to grasp things sometimes, to understand what you might have been going through. I did an interview today for a television show on human trafficking for MSNBC, and I expressed my frustration over the thought that it might be possible that you see my blogs and yet you don't respond. But perhaps that's wrong of me. If you are out there reading this blog, then I know that it must be a special kind of pain that keeps you from responding ... and it would be wrong of me to add to your pain with my own. So I just want you to know, if you don't feel you can come home because you have children you need to protect, I understand. Believe me, I understand. There is nothing I wouldn't have done or given up for you, and I know you would feel the same way about your own children. I just do wish that if this is the case you would find a way to let me know you are okay. Comment on this blog. Ask me not to print it and I won't. Just tell me something the average blog reader would not know so that I will know it is you. And tell me how you are. Please. My standard birthday greetings for friends is that they will have an awesome year, filled with love and laughter and happiness. That is what I wish for you as well, my sweet Michaela, wherever you are, a million times over. Thank you so much to Thelma for the beautiful picture! You have the most amazing ways in your writing of reaching out to Michaela. If she ever sees your blogs, she will surely feel the depths of your love for her, and her pain will surely be eased. You're understanding about her dedication to her own possible children, is evident of a true mothers love, putting her childs needs before self. Regardless of the pain. It's what all loving mothers do, isn't it? I hope she is indeed out there somewhere and does let you know some day. Sharon, will your interview with msnbc be aired. Happy Birthday, Michaela! I pray with all my heart that you come home safely. Sharon, thank you for sharing Michaela with your readers - she is special and loved so much by even those who did not know her. Through you, she has become a part of our families and is in my thoughts and prayers everyday. Your love for her shines out strongly and I am sure that she can feel it where she is. I am glad that today is a day that is filled with the happy memories of the times she brought into your life. It was intended for her to spend her life with you and I feel that someday, somehow this will happen. Wish you peace and happiness in this New Year. I read this beautiful letter you wrote to Michaela yesterday and it touched my heart so much like all of your letters do. Two of my Grandkids and I pray for Michaela all the time and we just sang Happy birthday to her picture with the lit candle in front of it. I long for the day when you get to sing Happy Birthday to Michaela once again face to face in person. Thanks again Sharon for letting me be your friend and sharing about Michaela. Like I always say I will never give up Hope on finding Michaela. 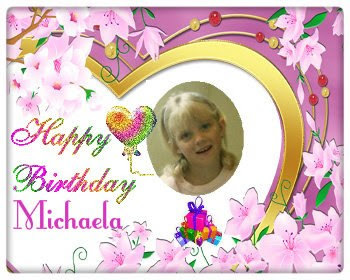 Lots of Love, Hugs and Prayers for Michaela, You and All Your Family. Happy late Birthday Michaela!! I hope wish your wishes come true but also yesterday was Kevin Collins birthday too. They have the same birthday oddly just 5 years apart. Yes I know. I put it on Michaela's facebook. 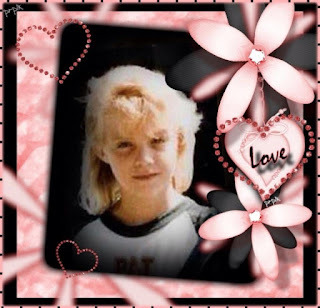 It is also the birthday of Jenna Ray Robbins, missing from Texas since 1989.